Most recently, Drew was announced as a 2018 winner of a $25,000 Career Grant from the Avery Fisher Artist Program. Previously, Drew was the winner of the 2017 American Pianists Award. As part of this award, Drew received the Christel DeHaan Classical Fellowship, cash, and two-years of career advancement, including serving as Artist-in-Residence at the University of Indianapolis. 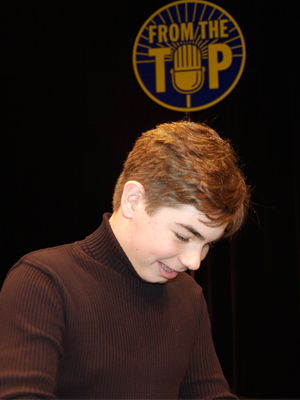 In 2015, Drew placed 4th in the very prestigious Leeds International Piano Competition held in Leeds, West Yorkshire! You can stay up-to-date on all of Drew’s musical activities by visiting his website! Drew performed on Show 133, recorded in February 2006, at age 12. He also From the Top at Carnegie Hall on PBS. Drew Petersen (piano), 12, says he “did not get into music, music got into me.” Drew has been playing the piano since age 5, and now studies at Manhattan School of Music. His other interests include swimming, hiking, biking, reading, and playing strategy games. He is currently in the seventh grade at Dwight Englewood School, and resides in Oradell, New Jersey.